First the advocates of an Independent Somaliland drew up a Bill that will have the US recgonize their Independence. Then Adovocates for an Independent Southern Cameroun have started a campaign here in the US. Now a Third Region is asking for US Help in Seceding from Another Country. What will the Administration do? According to Roman Catholic Sources in the region, Last Month Elders from the Island of Penda approached Mark Green to forward a Message that they wished to have delivered to President Bush. What was in that Message? They wanted the Assistance of the United States Government in breaking away from Tanzania. The Elders have made a similar plea to the United Nations as well. There are two key factors to the crisis. First of all the Leaders feel that the Current Administration of President Amani Abeid Karame of Margainilizing Penda. They feel that no Investments are made on the Island. Secondly Pemba is a stronghold of the CUF (Civic United Front)there has been a Power Sharing Accord with the CCM (Chama Cha Mapinduzi). This accord took 14 months to negotiate but has not been endorsed by the Executive Leadership of the CCM. Above you see a Map of Tanzania. Penda Island is the Northern-Most Island in the Offshore Chain. In recent days Security Forces took seven of the Elders into custody and flew them to the mainland of Tanzania. This action was taken after the Elders met with an Official from the United Nations. In a Press Briefing A Tanzanian Government Minister stated that the actions of the Elders was "Malicious" in Nature. He Stated such an Effort went against the Constitution of Tanzania. Makes one wonder why so many disaffected people reach out to the United States for Assistance Doesn't it? 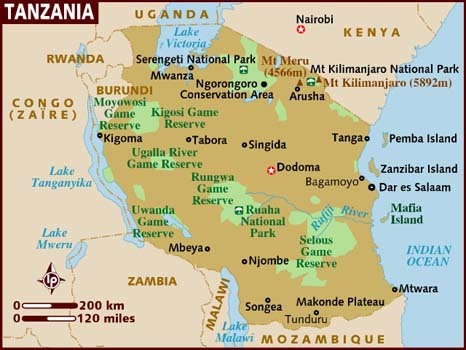 This article contains information from the Catholic Information Service for Africa and the Citizen Newspaper from Dar Es Salaam, Tanzania. There has been very little if any Mention of this in the US Media.